Kylin board is a develop board based on Rockchip RK3036. RK3036 is a low power, high performance processor solution for IOT, OTT BOX, and other digital multimedia applications, and integrates dual-core Cortex-A7, with separate NEON coprocessor and 128KB L2 Cache. Many embedded powerful hardware engines provide optimized performance for high-end application. RK3036 supports almost full-format 1080P H.264 decoder and H.265 decoder, high-quality JPEG decoder and special image preprocessor and postprocessor. Embedded 3D GPU makes RK3036 completely compatible with OpenGL ES1.1 and 2.0, OpenVG1.1 etc. RK3036 has high-performance external memory interface (DDR3/DDR3L) capable of sustaining demanding memory bandwidths, also provides a complete set of peripheral interface to support very flexible applications. Kylin board is a reference design of RK3036 SoC targeted at IOT/OTT solutions, including almost all functions of RK3036 chip such as HDMI, USB(OTG & Host), Ethernet, GPIO, codec, WIFI, Bluetooth, SD card. Here is a brief introduce about these interfaces on Kylin as the image shown on right side. Reset Key, button to reset system. Maskrom Key, button to enter Maskrom mode for loader/uboot flashing. Fastboot Key, button to enter Fastboot mode for images downloading. Recovery Key, button to enter Recovery mode. Kylin contains three mini-USB ports for Power Supply(5V/1.5A), UART2 Debugging, and OTG(On-The-Go) connectors, and one Stander-A plug for USB host connector. 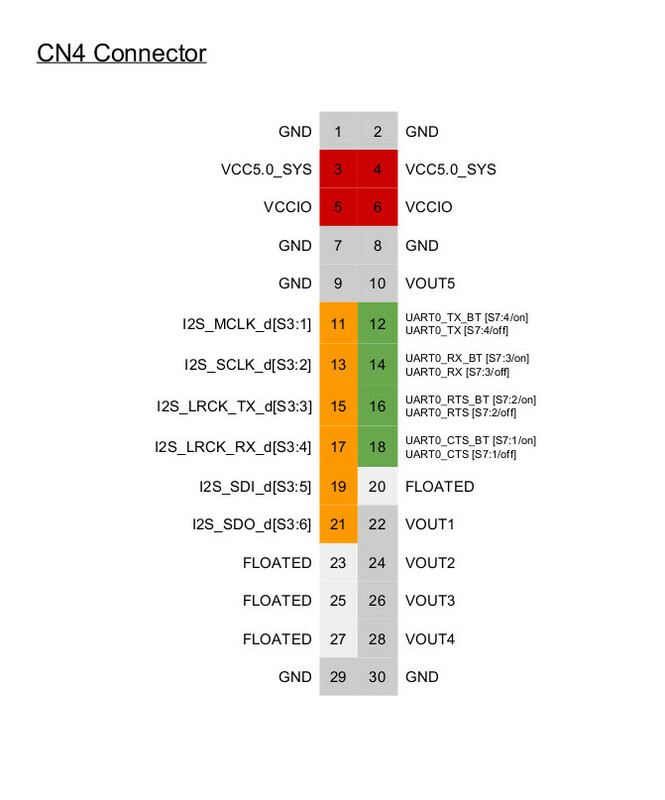 UART2 is the default debug serial port, whose pins are mux with SDMMC0. When the SD card is not inserted(SDMMC_DET is in high level), these pins are switched into UART2 mode, otherwise into SDMMC0 mode. So please note that SD card and UART2 are not compossible on Kylin board, unplugging SD card before ‘minicom’(or ‘cu’ etc.) connecting to /dev/ttyUSB*. For function extension, there are two connectors(CN2 and CN4) and five switches(or jumpers), S2/S3/S4/S5/S7, on Kylin board. 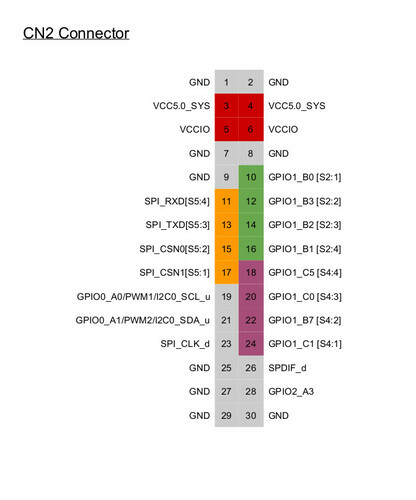 As describe in these two images below, CN2 and CN4 extend SPI/UART/I2C/I2S/GPIO/SPDIF/PWM functions, and VOUT[1-5] controlled by PMIC output V/A from 0.8~3.4V/150-300mA. Note that some pins are controlled by switches, some are not and always enabled. Switches only enable pins of connectors, which means they do not cut off any on board connection. For example, S3 switch can enable the 11/13/15/17/19/21 pins of CN4 acted as I2S function by connecting to SoC RK3036 I2S that shared with on board codec(RT5616). So you have to disabled RT5616 first before debugging external codec.